Reading and share top 4 famous quotes and sayings about Bush Saddam by famous authors and people. Browse top 4 famous quotes and sayings about Bush Saddam by most favorite authors. 1. 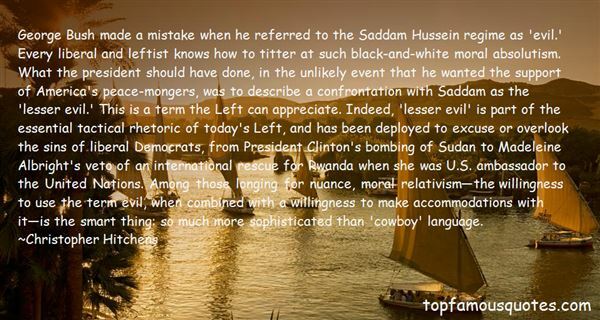 "George W. Bush and Tony Blair had to convince the world that Saddam Hussein represented an imminent threat. Tony Blair lied when he claimed that Iraq could launch a chemical or biological attack within 45 minutes." 2. 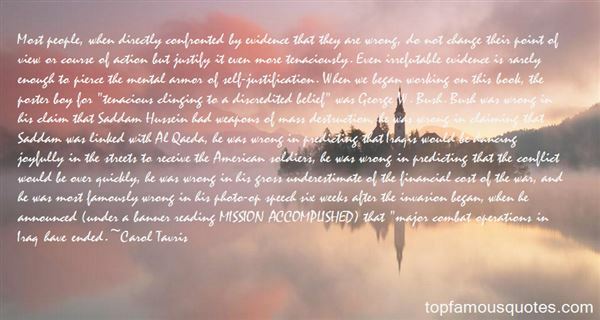 "Most people, when directly confronted by evidence that they are wrong, do not change their point of view or course of action but justify it even more tenaciously. Even irrefutable evidence is rarely enough to pierce the mental armor of self-justification. When we began working on this book, the poster boy for "tenacious clinging to a discredited belief" was George W. Bush. Bush was wrong in his claim that Saddam Hussein had weapons of mass destruction, he was wrong in claiming that Saddam was linked with Al Qaeda, he was wrong in predicting that Iraqis would be dancing joyfully in the streets to receive the American soldiers, he was wrong in predicting that the conflict would be over quickly, he was wrong in his gross underestimate of the financial cost of the war, and he was most famously wrong in his photo-op speech six weeks after the invasion began, when he announced (under a banner reading MISSION ACCOMPLISHED) that "major combat operations in Iraq have ended." 3. "George Bush made a mistake when he referred to the Saddam Hussein regime as 'evil.' Every liberal and leftist knows how to titter at such black-and-white moral absolutism. What the president should have done, in the unlikely event that he wanted the support of America's peace-mongers, was to describe a confrontation with Saddam as the 'lesser evil.' This is a term the Left can appreciate. Indeed, 'lesser evil' is part of the essential tactical rhetoric of today's Left, and has been deployed to excuse or overlook the sins of liberal Democrats, from President Clinton's bombing of Sudan to Madeleine Albright's veto of an international rescue for Rwanda when she was U.S. ambassador to the United Nations. Among those longing for nuance, moral relativism—the willingness to use the term evil, when combined with a willingness to make accommodations with it—is the smart thing: so much more sophisticated than 'cowboy' language." 4. "In searching for a rationale to go to war, Bush settled on the notion of Saddam as an incarnation of evil, basically, and convinced himself that Saddam was fundamentally Adolf Hitler reborn. 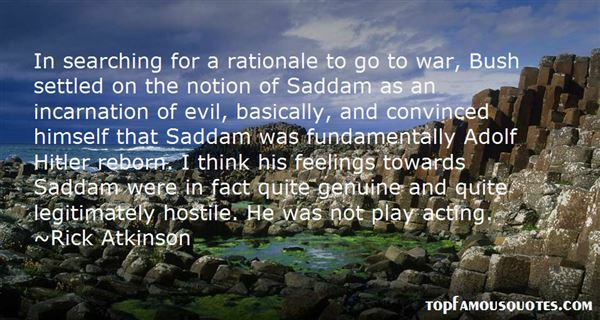 I think his feelings towards Saddam were in fact quite genuine and quite legitimately hostile. He was not play acting." But it's always useful to know where a friend-and-relation is, whether you want him or whether you don't."